In the past 2 years I would hazard a guess that I’ve done a little under a dozen workouts more than an hour long. Most workouts a little less than 45 mins all of which typically included a 10 minute warm up on a piece of CV equipment of some description. Essentially the weights I’ve done have been around 35 mins in total. I’m an experienced trainee. I’ve been going to the gym for almost 25 years and therefore I’ll typically need more training volume than most to progress or maintain. My training intent is largely to maintain and my diet dictates what happens in response to my training. I train for the most part in a commercial gym. I don’t have any exclusivity over equipment so I have to improvise sometimes and therefore my workout plays around loose guidelines. 12-16 sets per muscle group per session. 2 sessions per muscle group over an 8 day period. Maintaining intensity over 35 mins is much easier than 60+ mins. This means I hit 70 mins of intense work a week. Increased protein synthesis. This is analogous of me employing builders to build an extension and getting them in 4-5 days a week instead of 2-3. If I train a muscle group once a week I’m elevating protein synthesis in that muscle for 48 hours over 8 days. If I hit it twice it’s elevated for 96 hours. Make sense. I take days off when they’re imposed because of life, work etc. I don’t plan them as I’m not a full time athlete. I certainly don’t beat myself up if I miss a day at the gym. If I’m tired I may take a day off or I maybe had a bad nights sleep. I don’t do much shoulders as in my case they get enough secondary stimulus for me and due to some past injuries they get aggravated easily. Muscle pain is ok, joint pain I’m very wary off as I age. 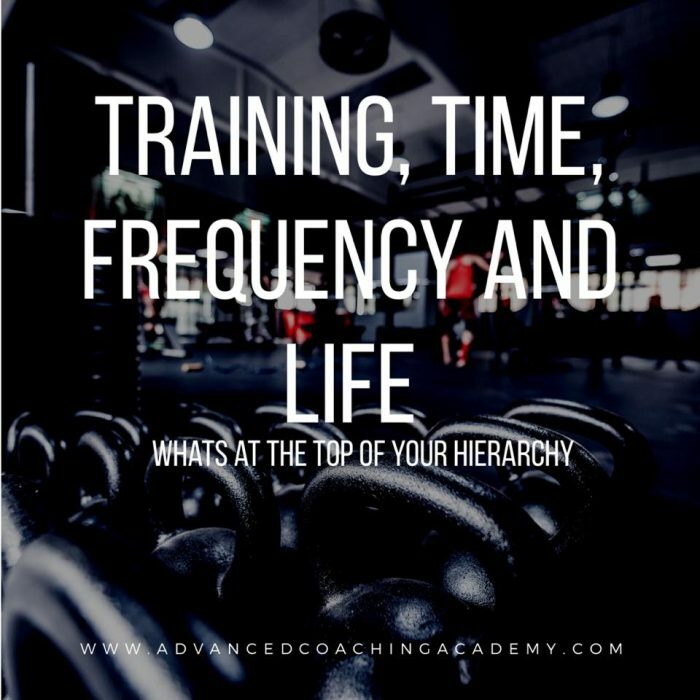 Having time to workout is about firstly it fitting into your life hierarchy. If in your 14-16 hours you’re awake working out doesn’t fit in you potentially don’t see or havn’t previously seen the value in it. My role as a coach is for firstly you to value it enough that it fits in there. If I take my hierarchy it would look something like this. The first ones take precedence over the last. As someone who values training as highly as I do both family and work take priority over ‘hitting the gym’. I’m also fortunate that my other half trains with me. We both see the value of training to our quality of life so therefore it’s something we plan for and fit in around the other two priorities. My point is. I could bang on about how important working out is to quality of life. If you’re flat broke, have no friends and your family are quite aware that they take secondary importance to your gym time your quality of life needs some context perhaps added to it. Looking awesome will only bring you so much happiness. If we consider simply health, longevity, the mental release that working out gives you maybe it will sit in a better hierarchal place. Working out and keeping fit and healthy is a necessity for life the way I see it. Living a life and being productive with your time is also another.